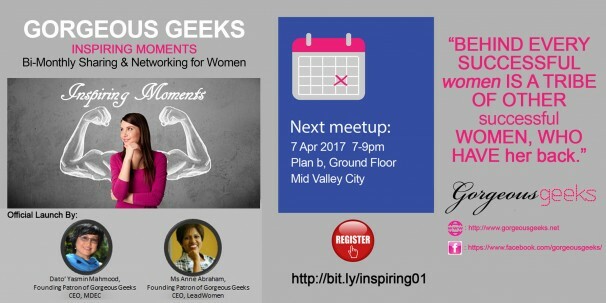 In conjunction with Gorgeous Geeks’ 9th Year Anniversary, we are launching a series of casual meetups involving good food, good stories, and opportunities to network with other ladies. This is the first of the series. Dato’ Yasmin Mahmood and Anne Abraham will be sharing their stories with us, moderated by Nadiah Tan Abdullah. We will also have dinner together, it will be at Plan B, MidValley. Set menu from RM30++ per pax or order from ala carte menu. Good food and good friends is the recipe for good things to happen!